Welcome to YOUR Ed Forum! The price of admission is your sincere desire to lend your voice and talents in transforming our education system into the very best this nation has to offer. The Education Town Hall is the intersection where parents, students, teachers, administrators, community members, policy makers and politicians can all meet to share stories, struggles, and solutions. If you feel that you haven’t had a voice before, please know that you do now. 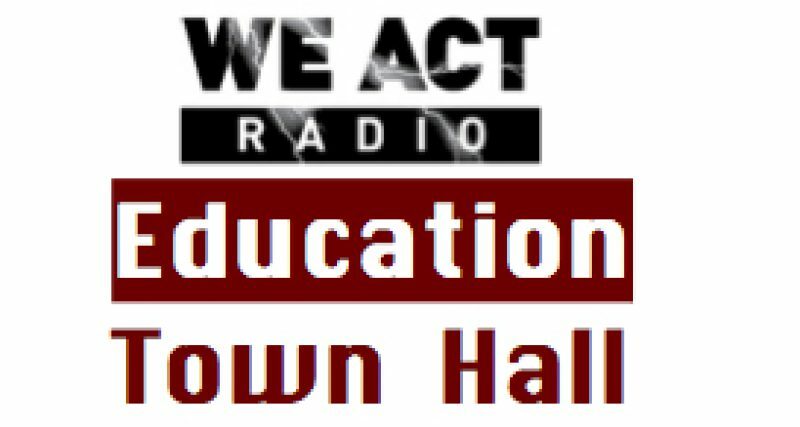 The Education Town Hall airs Thursdays on We Act Radio, broadcasting from Historic Anacostia in the nation’s capital, at 11:00 a.m. (Eastern). Listen via TuneIn wherever there’s internet. The Education Town Hall is part of the local “Live Wire” programming of We Act Radio: progressive radio broadcasting from Martin Luther King Avenue in Historic Anacostia. This forum extends the on-air “Education Town Hall” discussion and offers additional resources. We consider widely applicable education topics as well as those of particular concern to the immediate listening area: DC, Maryland, Virginia. Through radio and blog, citizens together explore today’s educational challenges and opportunities. Your thoughts are crucial, as we seek constructive ideas for our school communities and our neighborhoods. Guest blogs and comments are welcome here. Participate — and then #dosomething! Also join us on Facebook and on @EdTownHall on Twitter.